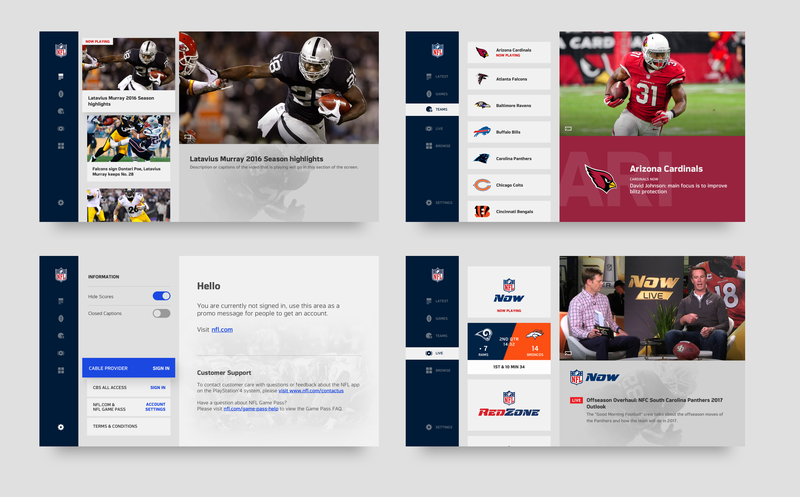 A major sports league chose our team to re-design their app for video experiences on Apple TV and Amazon Fire TV. My role as senior designer was to create and lead the interaction and visual design for the project. Due to NDA restrictions, the client name and logo has been blurred or removed from any images. 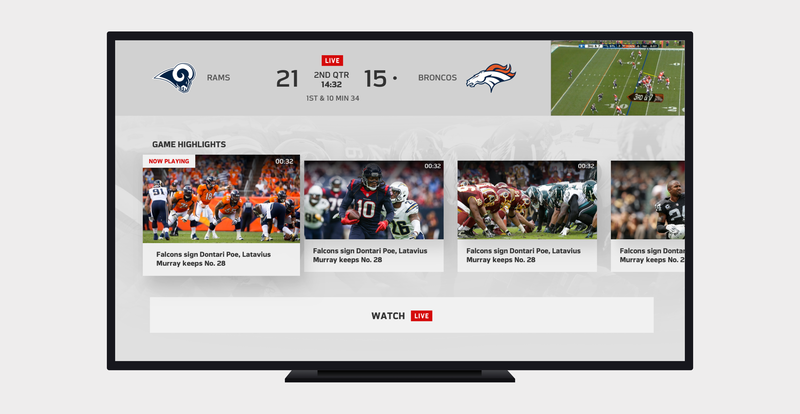 The sports league provides video content for both live and on demand. The suite of content includes games, shows, clips and live broadcasted channels. The client’s team shared key takeaways from their extensive customer research. We also conducted our own user research, including stakeholder interviews and crowd sourced online surveys. This led to creating a list of personas and key user goals. 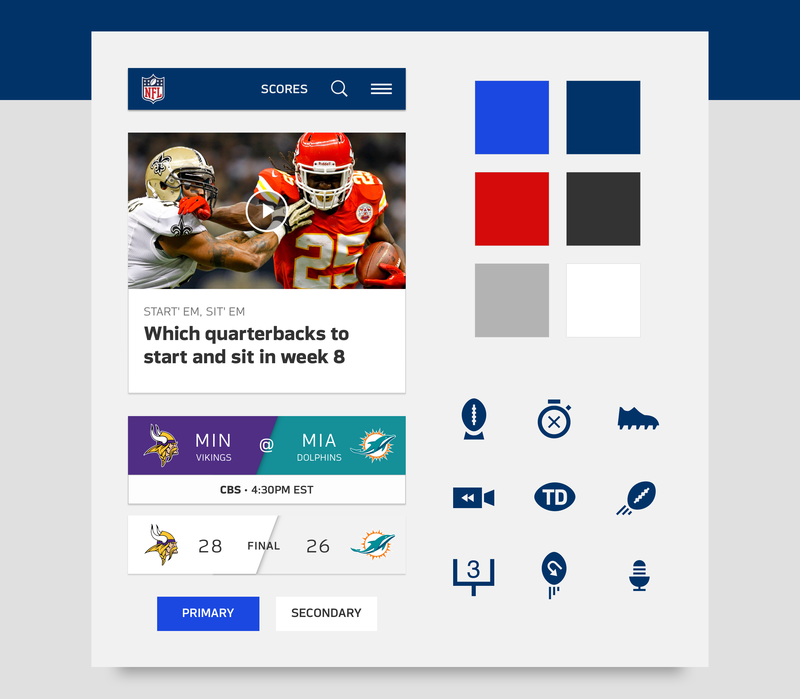 The client already had a brand style guide set for the mobile app and website. They wanted to maintain consistency within their digital products but had no specifications around 10ft platforms. We needed to take the current brand and expand it to TV. Before kicking off the official project, we had completed a small concept app delivered as a proof of concept project. This project was more of a vision piece with tighter deadlines and very flexible requirements. The project was a success and we won the business for the main project. We took what we learned and expanded the ideas into the official project. I’d be happy to share more details about the POC project one-on-one. The key business goals (in order) were to increase minutes watched, number of visits, app stability and paid subscriptions. They had a large bank of free videos but strict limitations with most of their live content (especially games) due to broadcasting rights and locations. The authentication system was very complex with multiple methods to authenticate and levels of content access. We had a strict deadline for launch and had to keep development efforts minimal to be able to achieve that date. We wanted to bring focus to the free content that was available to users while exploring the option of auto-play. We organized and led a 4 day creative session with the client’s product team through whiteboarding and rapid prototyping. We did an audit of all the content available and grouped them into categories which became our main sections for the app. 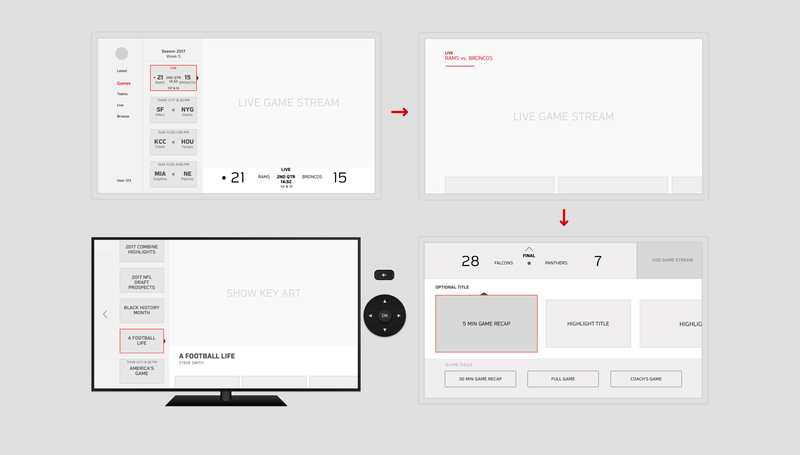 We then designed a user experience going through 3 key screens: the menu, the player and the deep dive. This structure could be re-used for each section of the app. Our continuous process was to create high level user flows, bring them to life in a wireframe and add them to an interactive prototype for testing. This process was repeated multiple times throughout the session and during the following weeks, constantly iterating and improving our idea. 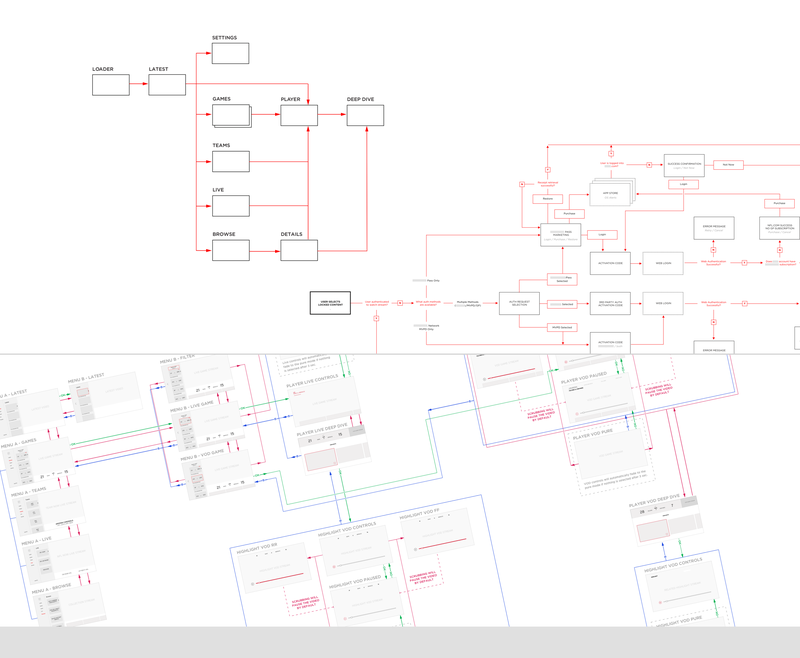 We finished with detailed annotated wireframes, extensive user flow diagrams and button mapping specifications. The menu has 3 panel sections with first level navigation items, 2nd level navigation items and a preview video. The preview auto-plays video based on the 1st level navigation item selected and users can scroll through the second navigation items to make a selection. In the game’s section we created a dynamic list order that brings live games to the top, places pre-games in the middle and pushes post-games to the bottom. The list items refresh each time the user enters this section. The key was to surface the most popular content first, even if that changed based on the current day and time. The deep dive screen is an extension of the player and can be accessed by navigating down from the player controls. The video shrinks down to the top right corner and the score bar data updates in real time. 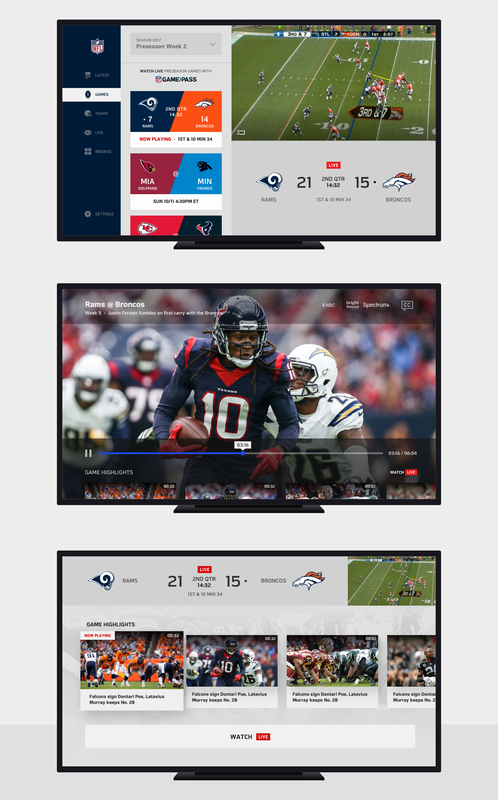 This deep dive allows users to browse extra content related to the video without missing any moments from the game. 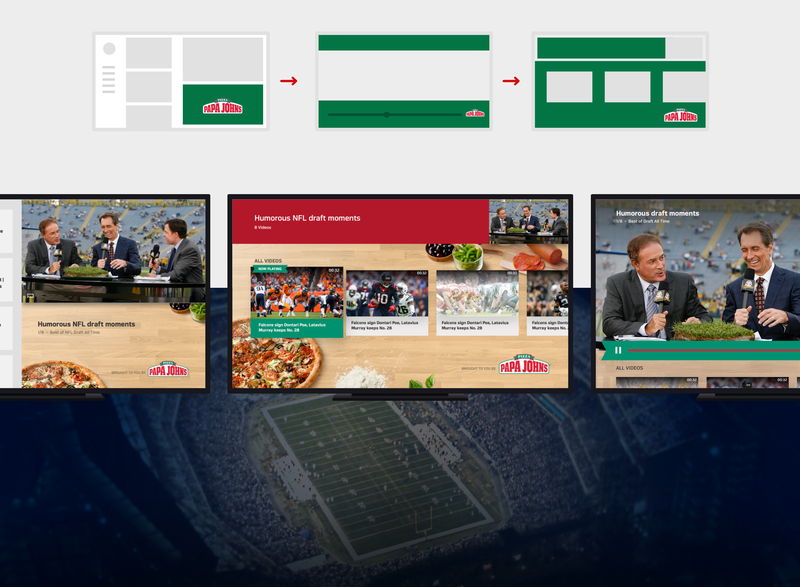 The 3 key screens were designed to be re-used for each type of content without changing the core interactions or user flows. The base skeleton remains the same while each individual element may vary in design to best suit the content’s needs. We worked closely with the development team throughout the entire process, ensuring efficiency and quality for the final product. The client had significant analytics installed to monitor the usage data and progress of the new app. We saw a significant increase for all our key performance indicators and continued to work on the project on new features for future and multiples releases. One of our new feature requirements was to introduce sponsorship opportunities for the business. Using our current design layout, we selected and identified specific parts of our components that could be used for advertisement without changing the user experience. These elements could be easily updated and uploaded by the client without new development efforts each time. Check out a website and app for Music for Young Children here.